Cottontail Tamarins have a very unusual appearance, as well as an extremely good abilities to adapt to living in captivity, which is why these animals have become very popular for holding in zoos. 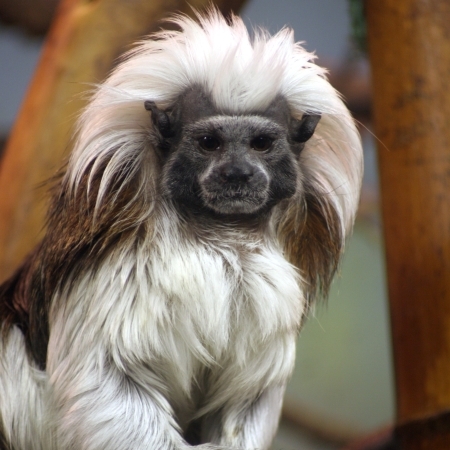 The animal’s Latin name (Oedipus) means “on swollen legs” refers to the tamarin’s long, woolly extremities. 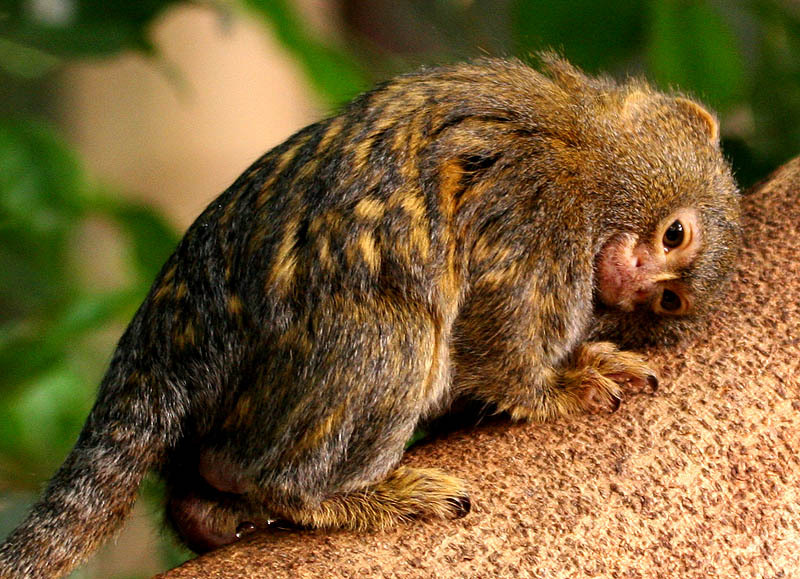 These tamarins are fairly small, their body reaching only 20-29 cm in length, while the tail is usually 31-42 cm long. It can be distinguished by the thick, woolly fur, which is usually reddish brown, while the legs, head and belly are white. Cottontop Tamarin’s name comes from the long, white mane on top of its head. These mammals inhabit only a small jungle territory in Northwestern Columbia. 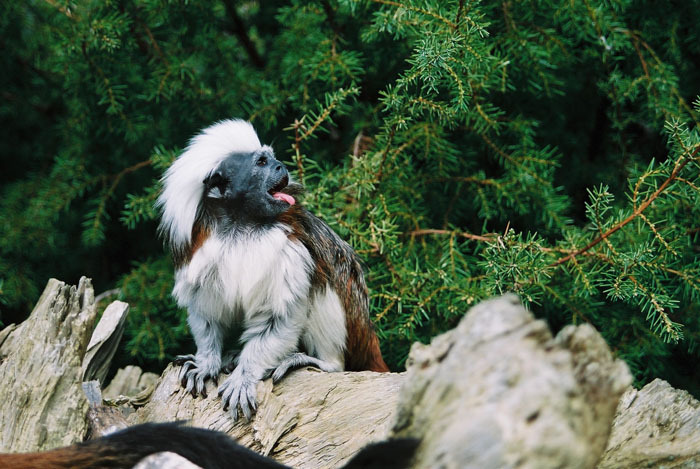 Cottontop Tamarins are very agile little monkeys that are active from early morning to late evening. At noon they usually have a rest, during which they tend their fur. These tamarins live in family groups made of 2-8 individuals. The group is strongly hierarchic, the father is an undisputable leader and although some younger members of the family may fight time to time, the father never gets involved. Being highly territorial animals, they are quite aggressive towards other tamarins invading their territory, and an interesting fact is that females are usually more aggressive when it comes to defending their territory. These tamarins feed on sweet fruits, flowers and sprouts, as well as tree juice, which they access by nibbling off tree bark. Weighing only 350-450 grams, the Cottontop Tamarin can walk on the smallest branches and access food that is out of reach for most other monkeys. They also catch bugs, spiders, lizards, frogs, small rodents and sometimes even birds, killing them with a bite to the head. Necessary water is obtained from nectar, fruits and dew. When the mating period comes, the male performs a ritual dance around the mother and shows off his impressive mane and white belly. Females often mate with more than one partner, although the family leader, which is the female’s “husband” is exclusively for her, and the female becomes very aggressive if another female wishes to mate with him. Pregnancy lasts for 140-145 days and usually twins are born. Upon birth they are already quite developed, with open eyes and firsts hints of the impressive mane. The upbringing is done mostly by the father, who carries its young on the back and only gives them to the mother when it’s time for feeding. 18-24 days later the young tamarins already start walking and feeding on the own, but they are still very dependent on their parents until the age of three months. Cottontop Tamarins are currently classified as “Extremely Endangered” by the IUCN and they’re severely harmed by forest logging and poaching.